At its opening on July 16, 2004, Chicago’s Millennium Park was hailed as one of the most important millennium projects in the world. “Politicians come and go; business leaders come and go,” proclaimed mayor Richard M. Daley, “but artists really define a city.” Part park, part outdoor art museum, part cultural center, and part performance space, Millennium Park is now an unprecedented combination of distinctive architecture, monumental sculpture, and innovative landscaping. Including structures and works by Frank Gehry, Anish Kapoor, Jaume Plensa, and Kathryn Gustafson, the park represents the collaborative efforts of hundreds to turn an unused railroad yard in the heart of the city into a world-class civic space—and, in the process, to create an entirely new kind of cultural philanthropy. Timothy Gilfoyle here offers a biography of this phenomenal undertaking, beginning before 1850 when the site of the park, the “city’s front yard,” was part of Lake Michigan. Gilfoyle studied the history of downtown; spent years with the planners, artists, and public officials behind Millennium Park; documented it at every stage of its construction; and traced the skeins of financing through municipal government, global corporations, private foundations, and wealthy civic leaders. The result is a thoroughly readable and lavishly illustrated testament to the park, the city, and all those attempting to think and act on a monumental scale. And underlying Gilfoyle’s history is also a revealing study of the globalization of art, the use of culture as an engine of economic expansion, and the nature of political and philanthropic power. landmark, and it now has the history it deserves. "Gilfoyle has given us an intelligent and meticulously researched account of this triumphant new centerpiece of the city’s downtown. 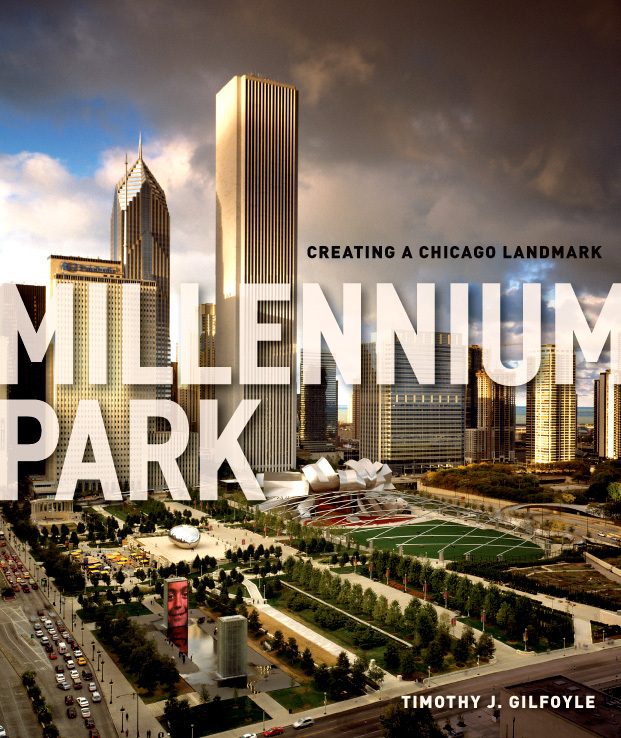 The book is handsomely produced, well-written , full of gorgeous photographs and tells the absorbing story of the Millennium Park site."